The base Fiesta is equipped with a 119-hp, 1.6-liter four-cylinder with 109 pounds-feet of torque. Ford Motor Co.'s 2011 Fiesta will carry a base price of $13,995 including shipping for the four-door sedan when it goes on sale in the summer. The base five-door Fiesta will sticker for $15,795. The Fiesta, Ford's newest nameplate, is slightly smaller than the Focus. Two models will be offered. The prices were announced yesterday on the Ford Web site fordvehicles.com/cars/fiesta A fully loaded model will carry a sticker price topping $23,000. 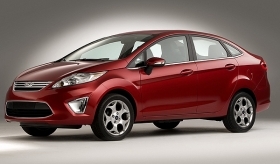 The base Fiesta is equipped with a 119-hp, 1.6-liter four-cylinder with 109 pounds-feet of torque. A five-speed manual is standard. A dual, dry-clutch, six-speed automatic transmission is optional. Electric power steering is standard, as are seven airbags including a driver's knee airbag. Antilock brakes and stability control also are standard.